Para reconquistar la libertadqueperdimos en el siglo XVI, los mexicanos debemos independizarnos de la cultura extranjera y readoptar la cultura mexicana a fin de que cumplan los altos Destinos de la Razaque son de bienestar y de grandeza. What is known today as the Mexicayotl movement was initiated by well-educated Nahuatl speakers during the Mexican Revolution and flourished under the presidency of Lazaro Cardenas. President Cardenas supported Indigenous education in Mexico and many of the founders of the movement worked in the schools he funded. Throughout the years this movement has been referred to by various names including Mexicayotl, Mexicanidad, Neoaztekatl, Aztekayotl, and Nativismo. The Mexicayotl movement is nationalistic in nature and strives to reject European influence along with the promotion of what the original founders claim is the original form of Nahuatl. Many people since the movement was created in the 1920’s have further developed the work of these progenitors. The claims of many of the members of Mexicayotl are problematic because they are purported to be based on oral tradition and as a result they can’t always be cross-referenced with other sources. The founder of Mexicayotl was Juan Luna Cardenas. In 1920 he formed the organization Ueyi Tlatekpanaliztli Ikniuhtik Aztekatl whereas his primary goal was to spread what he considered to be a pure form of Nahuatl. Together with Fidencio Villanueva Rojas he also worked with the Movimiento Confederado Restaurador de Anauak and Proyecto Aztekatl. At that time, Rojas and Cardenas preferred to use Azteka rather than the more recent Mexica. The Movimiento Confederado Restaurador de Anauak was co-founded by Ezequiel Linates Moctezuma in the 1950′s. 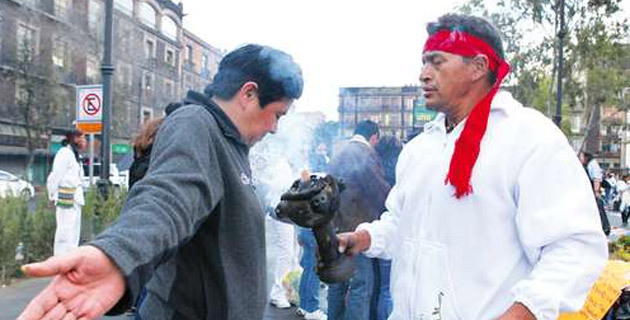 Although earlier organizations were founded by native Mexicans, The Movimiento Confederado Restaurador de Anauak began to incorporate urban mestizos. Moctezuma also founded the Pro-LenguaNahuatl Mariano Jacobo Rojas and Mexihkatlahtolkalli. Estanislao Ramírez Ruiz co-founded the Movimiento Confederado Restaurador de Anauak and was also a member of the Ueyi Tlatekpanaliztli Ikniuhtik Aztekatl, Aztekatlahtolmelauhkan, and the Kalmekak de Tláhuac. Ruiz claimed he was a direct descendant of the tlahtoani Nezahualcoyotl. In 1925, he became a professor of physics and chemistry. He spent many years disseminating the teaching of Nahuatl which he learned from his parents. In 1951, he ventured into the field of archaeology to participate in approximately 157 experiments to determine the authenticity of the supposed remains of Cuauhtemoc discovered in 1949 by Eualalia Guzman. Fidencio Villanueva Rojas was a member of Ueyi Tlatekpanaliztli Ikniuhtik Aztekatl and eventually became a professor. Later he became a leading member of the Gran Fraternidad de Amigos Aztekah. Along with the Academia de la Lengua Aztekatl, Rojas taught what he said was the pure form of Nahuatl that was spoken in Tenochtitlan. In addition to the leaders of the aforementioned organizations, there were many more prominent members who contributed greatly to the development of Mexicayotl in the early years including Nieva Rodolfo López, Ignacio Romerovargas Yturbide, Eulalia Guzman and Paula Gomez Alonzo. Many of the members of the early Neo Aztekah groups were forced to leave their villages due to the conflict between the Zapatistas and the Carrancistas further spreading their work. Robert H. Barlow – Mexican scholar who had ties with Neoaztekah organizations during the first part of the 20th century. Angel Maria Garibay– Mexican scholar who had ties with Neoaztekah organizations during the first part of the 20th century. Byron McAfee – Mexican scholar who had ties with Neoaztekah organizations during the first part of the 20th century. Ignacio Davila Garibi – Mexican scholar who had ties with Neoaztekah organizations during the first part of the 20th century. 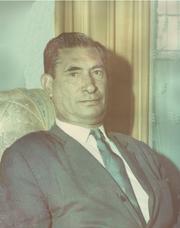 Mariano Silva y Aceves – Mexican scholar who had ties with Neoaztekah organizations during the first part of the 20th century. Estanislao Ramirez –Claimed to have had access to a secret Azteca understanding of the universe that was transmitted from elders in Tlahuac. He was the first to claim that Ometecuhtzintli who had always existed, was the single, invisible creator of the universe. Miguel Leon-Portilla– Mexican scholar who had ties with Neoaztekah organizations during the first part of the 20th century. Leon-Portilla created the term Ometeotl to combine the Teteo Ometecuhtli and Omecihuatl and also Tonacatecuhtli and Tonacihuatl into one entity. Carlos Castaneda – Anthropologist who fabricated a story to earn his PhD at UCLA (later revoked) about his meetings with a Yaqui Nagual named Don Juan. His stories about the use of psychotropic drugs such as peyote, shape-shifting, and the spirit world have been incorporated into the Mexicayotl movement by several people including Francisco Jimenez. Don Miguel Ruiz – Claims to have been passed down the oral traditions of the Tolteca. He popularized Toltec knowledge with the publication of his book, the Four Agreements. Francisco Jimenez a.k.a. Tlakaelel – Former member of the Movimiento Confederado Restaurador de Anauak. Jimenez claims that In 1943, he was one of the members of a group of youth (along with Pablo F. Garcia, Jose Gonzalez Rodriguez, Rodolfo Nieva Lopez, Aurora Morales, and Fedeico Rojas) who received the mandate of cuauhtemoc from the council of elders from Colhua in Xochimilco. He was the supreme director of In Kaltonal which was the first Indigenous spiritual organization to be recognized by the government of Mexico. He was also one of the first Mexicanists to reject the official history of Pre-Cuauhtemoc Mexico arguing that it is simply a discourse based on the lies of the conquerors and catholic priests who burned indigenous books containing the real records. He also rejects some anthropologists and archaeologists saying they are influenced to perpetuate these lies held by their respective governments. Jimenez incorporated the Lakota sun dance, sacred pipe riutuals, vision quest, and sweat lodges into his practice of Mexicayotl and also promoted the existence of extraterrestrials and other dimensions. 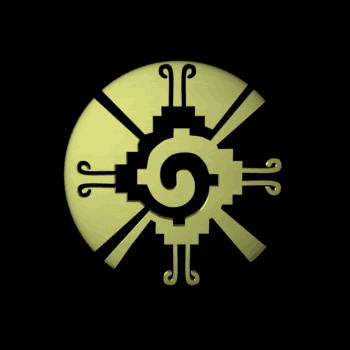 Jose Arguelles – Was the first to associate the familiar image below with the Mayan Hunab Ku which he translates as “one giver of movement and measure.” Arguelles claims he was in the town of Teotitlan del Valle shopping when a merchant told him “see, the ancient Mexicans also knew about Yin and Yang” while showing him a rug containing the aforementioned image as the weaved design. Arturo Meza – Suggested a calendar count used by many people throughout the Mexicayotl movement today based on his belief that ancient Mexicans divided up time into increments of 6 hours. He was one of the first to combine Leon-Portilla’s construction of Ometeotl with the Mayan Hunab Ku. Kurly Tlapoyawa – In 2000, Tlapoyawa published his first book We Will Rise which argues against the existence of human sacrifice, promotes Ixachilan as the correct word for North and South America defined as the great land, and promotes the idea that the first truly developed people originated in Ixachilan. Tlapoyawa has gone on to re-evaluate his previous views and is the founder of Yankwik Mexikayotl, which was created to promote a strong indigenous identity among Chicano-Mexicanos by reappropriating our pre-Kuauhtemok cultures, which are often distorted, unjustly maligned, and dismissed as irrelevant. Unknown Contributor –In the October 30, 1967 issue of the periodical Izkalotl, the “secret slogan of Anauak” (also known as the “Mandate of Cuauhtemoc”) was published. The mandate is the most well-known prophetic text within the movement today. Mexicanistas insist that this message was announced by Cuauhtemoc on August 12, 1521 one day before the fall of Tenochtitlan. Since the inception of the Mexicayotl movement in Mexico in the 1920’s under the presidency of Lazaro Cardenas, there have been many unsubstantiated claims made by various people which have unfortunately been accepted without question. This has resulted today in a widespread over-reliance on oral traditions and a rejection of valid sources such as archaeological finds and Pre-Cuauhtemoc books. Many people today believe in a creator named Ometeotl, recite the Mandate of Cuauhtemoc, use the word Ixachilan in reference to North and South America, wave the panketzalli flag, refer to the works of Don Miguel Ruiz and Carlos Castaneda as if they are non-fiction, and follow Meza’s calendar count without realizing that these claims are easily discredited simply due to the fact that none of them can be cross-referenced with any other valid source. The widespread belief that since many of our books were burned and some of the Spaniards lied/ exaggerated, we must rely on oral traditions for knowledge about our ancestors is simply wrong. Our history is actually very well-documented and major discoveries are being made through the study of Pre-Cuauhtemoc codices, inscriptions, and primary sources. It is time that we let go of these fabricated ideologies, begin to think critically, and reclaim our true history and culture. Mexica Handbook by Olin Tezcatlipoca. Aztekayotl-Mexihkayotl una Aproximacion Historica al Movimiento de la Mexicanid (1922-1959) by Baruc Noel Martinez Diaz. Ciudad Universitaria, Mexico, D.F., 2010. It is right and natural for our rich history to resurge. These leaders and advocates have made important contributions to this process. Now, it is beyond time that it be further uncovered and corrected, in order to bring the full truths into being. The image associated with the Mayan Hunab Ku and the all-Being Ometeotl contains the truths that continue to be forgotten, marginalized, and done violence to. And without those truths, what we know until now about everything Mexica is distorted. I am referring to the female qualities in all. The leaders listed in this article are all men, and, as happens when “HISstory” is written by a group of people, however well-intentioned, who are not representative of nature, the story told is only half-true, and some things are distorted beyond their original meaning, as happens when you attempt to make sense of something without seeing its full context. Cuauhtemoc is only half of the leadership story. Tlaloc is part of the divine entity concerning waters. Until we see, embrace, respect, and love everything feminine, including women from Mexica history, female deities, the moon, and all female energies in both men and women, we will continue to suffer from our myoptic view of the universe. Yolpaqui.